Note: Today we are combining Olympic lifting (the Push Jerk or Split Jerk) with the tempo training methodology for the shoulder press. The tempo is a three second descent, touch the shoulder, and immediately Jerk the weight to the top position. This combination “overloads” the descending press for increased strength, and fatigues the shoulder for exacting Jerk technique. Pure awesomeness. For the Rope Climb, Advanced Athletes can experiment with a “Slow Decent” in the same manner as the Tempo Pull-up training. Compare today’s weight to June 23, 2016, and try to add 5lb. to each working set. 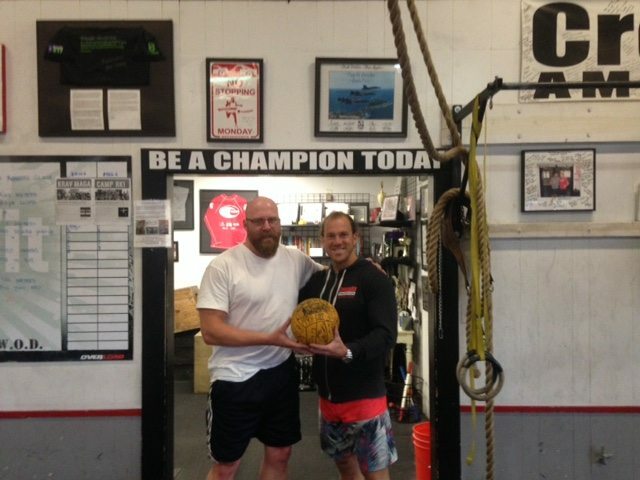 Shaun is one of our dedicated 6:00 AM Athletes, and a longtime friend of Greg Amundson. Shaun and Greg met during the summer 1997 at UC Santa Cruz, where they played Water Polo together. Shaun was the all-star goalie who lead the UCSC team to a 3rd place NCAA Division Championship in 1999. The Water Polo ball that we keep in our gym was signed by Shaun, and the winning team, following the championship game. Shaun continues to play club Water Polo at a very competitive level, and is also a dedicated Triathlete. It’s awesome to have Shaun in our gym!